UPDATE – Gov. Scott Walker on Thursday met with representatives from Green Bay-based Schneider National, one of the nation’s largest trucking companies. The meeting apparently was scheduled before word broke that the Assembly was pushing a proposal that would hit heavy trucks with a new per mile fee. Walker “got an earful,” according to Neal Kedzie, president of the Wisconsin Motor Carriers Association. 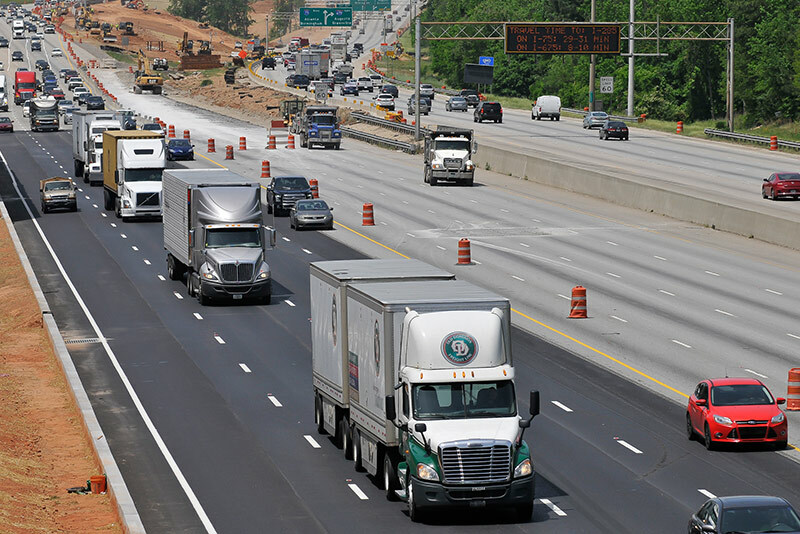 “My contacts at Schneider told me they expressed their disapproval and did not feel the trucking industry should be singled out as the only highway user group to fund the bulk of the state’s transportation budget shortfall,” Kenzie said. Schneider officials could not be reached for comment. The governor’s office has not returned MacIver News Service’s email’s seeking comment, even communications asking to confirm the governor’s schedule. A source with knowledge of the situation confirmed Kedzie’s account. The Motor Carriers joined coalition of 16 trade groups and businesses – from Walmart to Schneider National – in sending a memo Thursday afternoon to Walker and lawmakers expressing their opposition to the idea. “We strongly oppose the current proposal being considered to assess a Ton Per Mile (TPM) tax on heavy trucks,” the letter states. The coalition asserts Wisconsin’s trucking industry paid 38 percent of all taxes and fees owed by Wisconsin motorists in 2016, and it pays one of the highest trucking registration fees in the nation. Assembly Speaker Robin Vos (R-Rochester) on Thursday told the AP the fee could be one of the key pieces in a transportation budget deal, and that Walker is “alligned” with the Assembly on the deal. Others with knowledge of a meeting Wednesday between the governor, Vos, and Senate Majority Leader Scott Fitzgerald (R-Juneau) say Walker agreed to let the two houses work out an agreement on transportation funding and that the governor would not interfere. The Assembly and Senate have been at an impasse. Amid a transportation standoff between an Assembly that has pushed for “all options on the table” and a governor dead set against tax increases in a time of budget surpluses, Rep. Amy Loudenbeck (R-Clinton) earlier this month floated the heavy truck fee idea. Loudenbeck has said her proposal is similar to Kentucky’s heavy truck fee – at 2.85 cents per mile. The fee reportedly generate north of $200 million over the biennium for Wisconsin’s transportation coffers. It could also be disastrous to an industry operating on thin margins – an industry that transports more than two-thirds of the nation’s goods, critics of the proposal say. Loudenbeck told Wisconsin Public Radio that her proposal does not mean to put anyone at a competitive disadvantage. State Sen. Steve Nass (R-Whitewater) has come out against the proposal. So have taxpayer-advocate groups such Americans for Prosperity-Wisconsin. “Targeting heavy trucks with a TPM tax to fix Wisconsin’s transportation budget will raise the cost to do business here in Wisconsin, resulting in less routes through the state, increases prices for consumers and curtail new investment,” the memo states. Many of the coalition members have publicly or privately supported increasing revenue for transportation funding – including a gas tax increase. [Madison, Wis…] – An Assembly proposal that hits heavy trucks in Wisconsin with a per-mile fee to help fund the state’s troubled transportation fund isn’t sitting well with some conservative senators. Assembly Speaker Robin Vos (R-Rochester) says the Assembly backs the proposal “and is aligned with (Gov. Scott) Walker on budget,” according to a Tweet Thursday morning from the Associated Press’s Scott Bauer. Vos “says new fee on heavy trucks to pay for roads could be one of key pieces in budget deal,” Bauer tweeted. Vos’s office has not returned MacIver News’ requests for comment. Neither has Walker’s office. It is odd that a Republican governor who has adamantly said he would not support gas tax and fee hikes – something the Assembly has pushed from the beginning – would be on board with a plan to create a fee on one class of road users. Mikalsen and other Capitol insiders certainly find it hard to believe. They say they were told that Walker would not stand in the way of the Assembly and Senate negotiating a deal on the heavy truck fee. What isn’t clear is whether Walker promised not to veto the fee. Loudenbeck has said her proposal is similar to Kentucky’s heavy truck fee – at 2.85 cents per mile. The fee reportedly could generate north of $200 million over the biennium for Wisconsin’s transportation coffers. Wisconsin Manufacturers & Commerce, vehemently opposed to the heavy truck “tax,” asserts the fee would be the equivalent of a 20 cent per gallon tonnage tax on trucks. WMC estimates the cost to be between $130 and $135 million per year. Wisconsin’s haulers say the proposal will hit an industry that exists on paper thin margins. Loudenbeck told Wisconsin Public Radio that her proposal does not mean to put anyone at a competitive disadvantage. Proponents say it’s only right that the heavy users of Wisconsin’s highways put in their fair share to fund their upkeep. Critics say truckers already are paying more than their fair share. Scott Manley, WMC’s senior vice president of government relations, said the type of trucks targeted in the proposal typically account for around 10 percent of vehicle miles on Wisconsin’s roads, but their owners pay approximately 38 percent of the fees. Heavy trucks also pay the fifth highest annual registration fees in the country, Manley said. “Wisconsin is one of the most expensive states in the country to move a truck, and now the Legislature wants to make it even more expensive, to literally tax every mile they drive,” he said. The fee would only end up hurting an industry that directly serves Wisconsin’s critical manufacturing and agriculture sectors, Manley said. Mikalsen said consumers would ultimately pay the price for a tax on truckers. State Sen. Duey Stroebel (R-Saukville), said he hasn’t reviewed a Legislative Fiscal Bureau memo on the truck fee, but he has consistently said he’s not in support of tax increases. The LFB memo was not available Thursday morning. A Senate insider told MacIver News Service that there is a fair amount of resistance to the proposal in the Senate and that it is by no means a slam dunk. Senate Majority Leader Scott Fitzgerald’s office did not return a request for comment.